The Winnipeg Blue Bombers released defensive end Jason Vega and offensive lineman Steve Morley Monday in what appeared to be salary cap related moves. 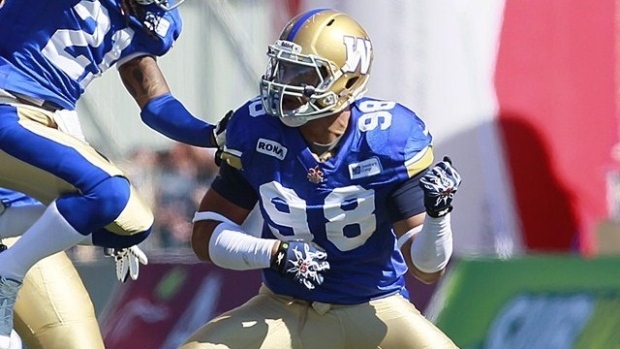 Vega spent the 2011 and 2012 seasons with the Blue Bombers before signing in the NFL. He returned last year to record 16 tackles and five sacks in just nine games. For his career, the 27-year-old has 82 tackles and 17 sacks. Morley meanwhile has been with the Blue Bombers since 2009. The veteran St. Mary’s product also spent time with the Toronto Argonauts and Saskatchewan Roughriders in his eight-year career.